Activation and progression of mitochondrial quality control in Parkinson’s disease and atypical Parkinsonian disorders. 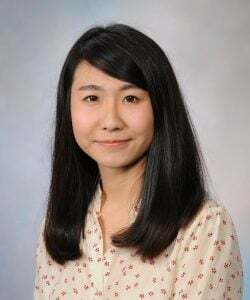 Dr. Hou received her BSc in Pharmacy from the Capital Medical University in Beijing, China and completed her PhD in Neuroscience from the University of Mississippi Medical Center. She then joined the lab of Dr. Wolfdieter Springer at the Mayo Clinic, Jacksonville in 2016 for post-doctoral training. Dr. Hou is interested in the neuroprotective capacities of the PINK1/Parkin-directed mitochondrial quality control (mitoQC) in Parkinson’s disease and has developed a standardized method to quantify levels and distributions of the mitophagy tag in human brain tissue using novel in-house antibodies. As a cytoprotective mechanism, enzymes PINK1 and Parkin cooperatively tag damaged mitochondria with phosphorylated-ubiquitin (pS65-Ub) chains for degradation via autophagic/lysosomal routes (mitophagy). This stress-induced mitoQC pathway is critical for survival of dopaminergic neurons that are under enormous metabolic strain and prone to mitochondrial and lysosomal dysfunctions. The goal of this study is to assess the ‘mitophagy tag’ pS65-Ub levels, distribution and association with markers of mitoQC progression in post-mortem brains of PD and atypical Parkinsonian disorders as well as in mitochondrial and autophagic/lysosomal diseases that can also affect the substantia nigra. Together with kinetic analysis of mitoQC activation and progression in corresponding disease fibroblasts, this will determine the relative contributions of organelle dysfunctions to pathology. The study will establish a better understanding of the role of mitoQC in DA neuron vulnerability and provide potential therapeutic strategies for Parkinsonian disorders.